Their efforts focus on plant-visiting “fruit and nectar” bats because they are vulnerable to extinction yet vital to the world’s rainforests and deserts and to the economies of developing countries. By protecting these bats they are working to conserve the more than 145 genera of plants that depend on them for pollination and seed dispersal; the countless organisms that depend on those plants for food and shelter; and ultimately all people that depend on healthy ecosystems. Compared to popular charismatic animals such as tigers, elephants and rhinos, the plight of bats has received less attention, less media coverage and, as a result, less funding for conservation-related activities. Decades of neglect by scientists and conservation biologists have left over half of the 1,116 bat species on our planet classified as threatened or near threatened with extinction (IUCN 2006). It is a commonly held belief that species occurring in large numbers such as flying foxes are not endangered. Unfortunately this is a fallacy. The population of the migratory North American passenger pigeon dropped from billions to extinction over a 40 year period as a result of changes to its habitat and harvesting for urban markets. Long before a species becomes extinct, its population can be reduced to a point where it fails to perform its essential ecosystem functions. Life on earth is a jigsaw – each plant or animal being connected to others by processes we call ecological functions. Pollination and seed dispersal are examples of ecological functions that fruit and nectar bats provide as a service to people. 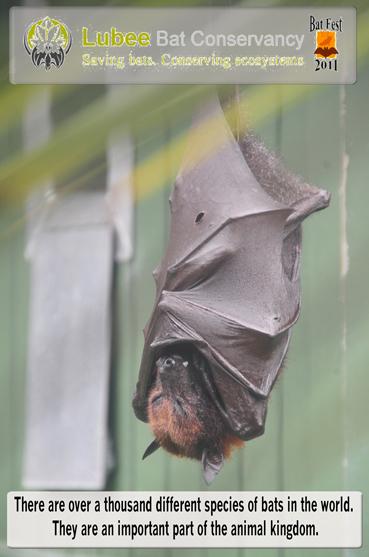 Fruit and nectar feeding bats play a pivotal role in the ecology of tropical rainforests, sharing the role of seed dispersal and pollination with birds and insects. By visiting flowers in search of nectar, the bats pick up and deposit pollen from flower to flower, pollinating them and allowing viable seeds and fruits to grow. In addition, fruit bats disperse the seeds of fruits, either by carrying off the fruit to eat it or depositing seeds in their droppings as they fly. Because fruit bats can fly long distances, they are able to move between flowering trees which are widely separated, helping maintain forest diversity and regenerate forests at a landscape scale. 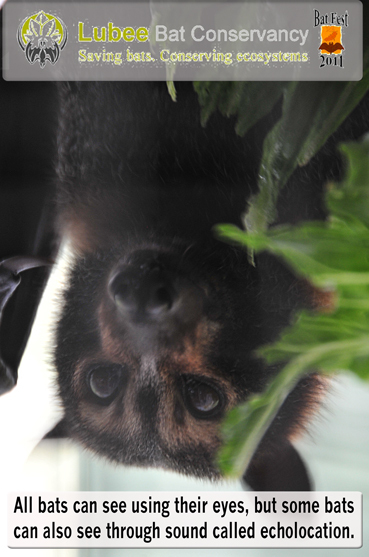 Lubee manages the world’s largest and most diverse collection of fruit bats in captivity. 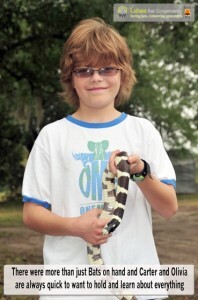 Lubee’s living animal collection serves many valuable purposes. 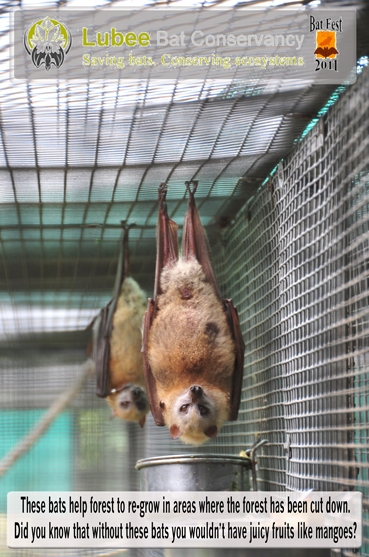 The bats provide availability of animals that are difficult to study in the wild, enabling us to identify the needs of endangered species and to focus our conservation efforts. 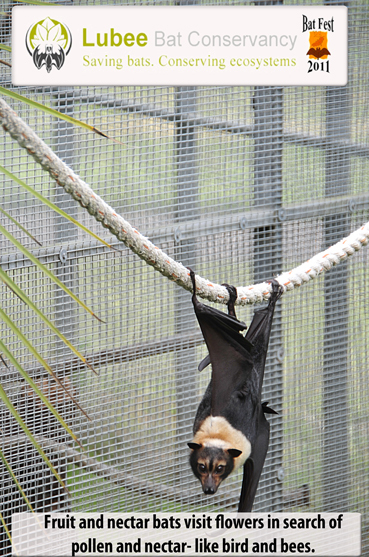 The bats also provide a teaching tool, to explain to students the urgency of problems facing fruit bats in the wild. Culled as crop pests, hunted as food items and losing forests they rely on for food and shelter, fruit bat populations are disappearing at an alarming rate. Please consider making a contribution to the work of the Lubee Bat Conservancy. All gifts are tax deductible. 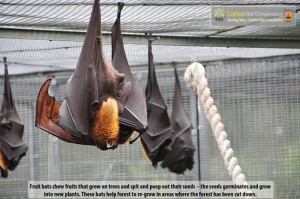 With the symbolic adoption of a fruit bat for your, as a gift or for your school class- you join Lubee’s efforts to save bats that pollinate flowers and disperse seeds of fruits – growing forests and food for all. Your adoption will help feed a bat (they love melon and apples and bananas) help provide veterinary care for a bat, and will additionally help support our conservation programs that help fight the conservation threats to fruit and nectar bats globally. Become a steward of one of these magical creatures (as seen in Harry Potter movies!) …and remember… bats are the real stars of the night!